Spring has finally arrived, and with it comes the birth of this year’s first generation of Karner blue caterpillars. 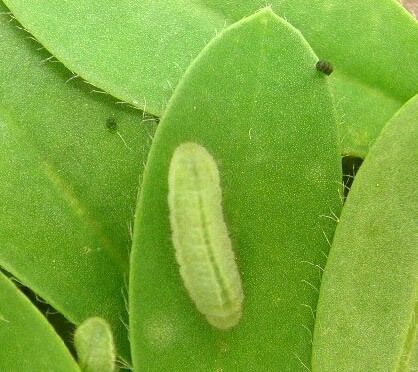 When these caterpillars hatch from the eggs that were laid by last year’s second generation of adults, they will eat only one thing, the leaves of the wild blue lupine plant. And you thought your kids were picky eaters! 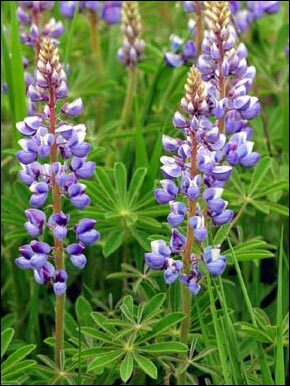 Wild blue lupine is a perennial plant that prefers dry, sandy soils in open patches of land. It is typically found in pine barrens and oak savanna plant communities. These habitats require ecological disturbances, such as wildfires, to sustain the sunny, open areas that wild blue lupine needs to survive. Land development and the suppression of natural disturbances in these areas have led to degradation and loss of habitat, causing drastic declines in Karner blue butterfly populations. As a result of this, the Karner blue butterfly was declared endangered in New York in 1977 and federally endangered in 1992. The Karner blue butterfly’s range extends from Minnesota to New Hampshire, along the northern portion of the blue lupine’s range. In New York, populations are found from the Albany Pine Bush north to Glens Falls, with a segment of suitable habitat found in Saratoga Spa State Park. Wild blue lupine. Photo by USFWS; Joel Trick. There are two generations of Karner blue butterflies born each year, the first of which hatches in May from eggs that were laid the previous July. This timing coincides with the blooming of wild blue lupine flower stalks. The caterpillars spend about two to three weeks feeding on wild blue lupine leaves before they pupate. The adult Karner blue butterflies emerge at the end of May or beginning of June and typically live for about a week. During this time, the adult females lay their eggs on the underside of wild blue lupine leaves or stems. The eggs take around a week to hatch and the second generation of adults appear in mid-July to early August. This time the females lay their eggs on the ground close to the stem of a blue lupine plant to provide them with more protection as they overwinter. Karner blue caterpillar (larva). Photo by Paul Labus, The Nature Conservancy, Indiana. Adult Karner blue butterflies are relatively small, with an average wingspan of about one inch. You can tell the difference between males and females by looking at the coloration on the tops of their wings. Males’ wings are silvery blue to violet blue with a black margin and white fringed edges, while females’ wings are grayish brown towards the edges, turning into violet-blue in the centers of the wings. Both males and females are gray with black spots on their undersides and have a band of orange crescents along the edges of both wings. Females also have bands of orange crescents on the tops of their wings, while males do not. Male Karner blue butterfly. Photo by Paul Labus, The Nature Conservancy, Indiana. Female Karner blue butterfly. Photo by Paul Labus, The Nature Conservancy, Indiana. Underside of the Karner blue butterfly. Photo by USFWS; Phil Delphey. There are 18.5 acres of endangered Karner blue butterfly habitat in Saratoga Spa State Park. In recent years, restoration efforts have re-established approximately 5 of these acres as suitable Karner blue butterfly habitat. This was accomplished through the removal of small trees and shrubs that had taken over the habitat, as well as the scraping away of topsoil to remove invasive plant seeds and to expose the sandy soils that wild blue lupine needs to grow. 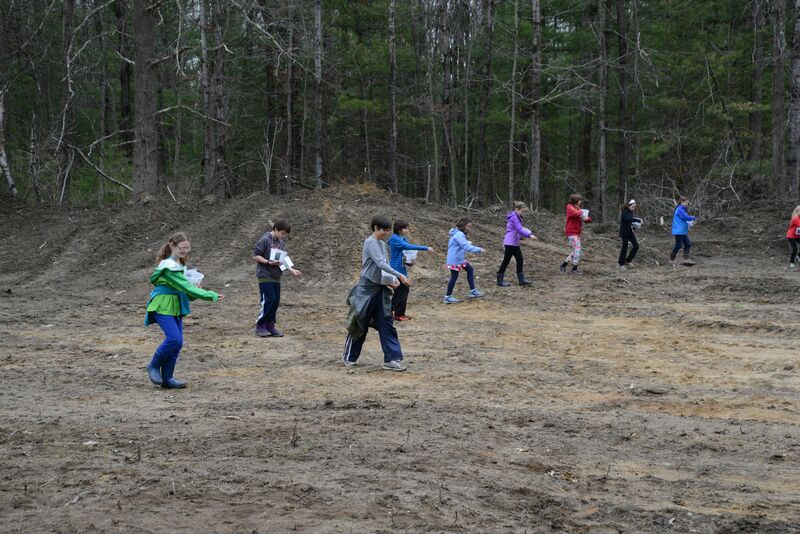 Wild blue lupine and native nectar species were then planted in the exposed sandy soil. Saratoga Spa State Park staff monitors the Karner blue butterfly population and provide educational programs to the public about this endangered beauty. 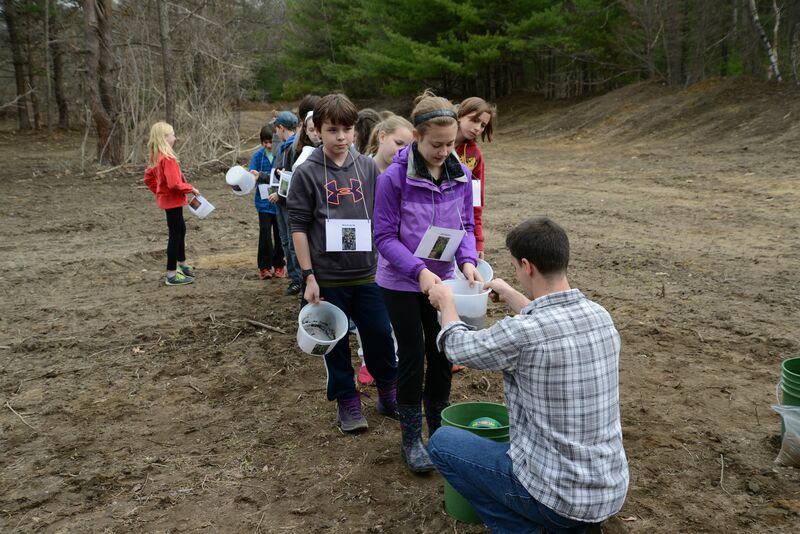 In celebration of Earth Day, students from the Waldorf School contributed to the Karner blue butterfly habitat restoration effort by spreading the seed of the native blue lupine plant on 1.5 acres at Saratoga Spa State Park. Funding for this project was provided by Governor Cuomo’s NY Parks 2020 Initiative. Waldorf School students spreading blue lupine seed. Photo by John Rozell, OPRHP. Waldorf School students replenishing their seed supply. Photo by John Rozell, OPRHP. Post by Allie Smith, Saratoga Spa State Park.